I got this excellent, super easy Weight Watchers Chicken recipe with Stuffing for the crockpot from my mom. It’s comfort food without a million calories. My mom once lost 110 pounds on Weight Watchers. I have personally never done the program, but I do love many of the recipes. I did do a weight loss program last year, Optavia and ended up losing 36 pounds. For me this was massive. I had just hit the highest weight of my life and my now ex-husband had just walked out on us. I needed to make a change. I felt immensely proud of myself for losing that weight and still do. I enjoy the program so much I became a Optavia health coach. So, if you are looking for a program email me. The program is not for everyone, but for busy moms like me it’s ideal. 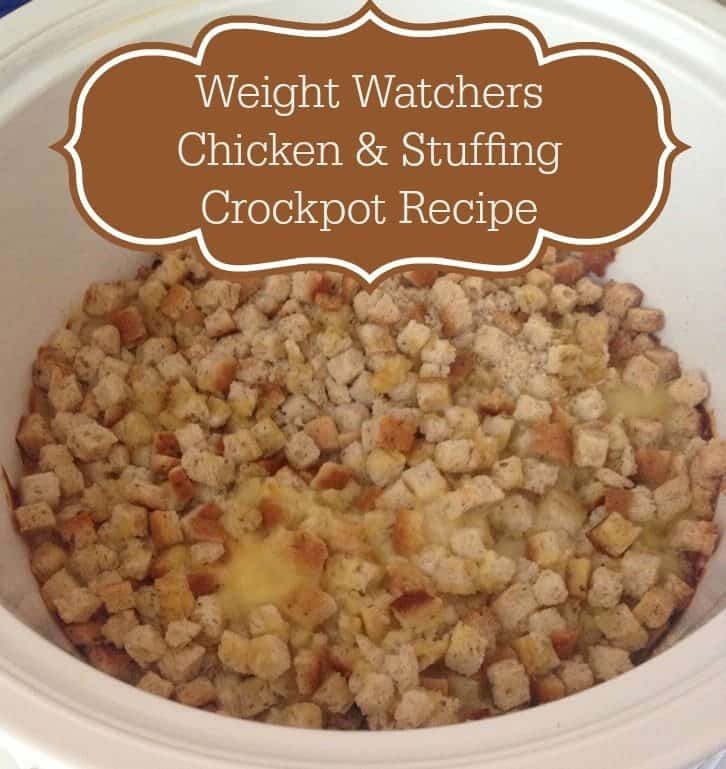 We even decided to have this Weight Watchers chicken and stuffing crockpot recipe last Christmas Eve instead of doing a whole Christmas meal. It was less work for everyone, only four ingredients! Plus, it was less calories than making a large Christmas dinner. And we are all about cutting calories. My friend Renee once ask me why I would work out and watch my eating week after week only to blow it on a week for vacation or holiday eating. I realized what she meant and now even during the holidays we try to eat better. 6 whole boneless, skinless chicken breasts. You can also use chicken thighs if you want and yes, you can use frozen chicken. 1 can 98% fat-free cream of mushroom soup — or any low fat cream soup like cream of chicken soup. Spray a 3 1/2 quart crockpot with cooking spray. Add chicken breasts. Combine stuffing, soup, and liquid. Spread over chicken. Cook on low 6 to 8 hours. Per serving: 321 calories; 6 g fat; 56 g protein; 7 g carbohydrate; 1 g dietary fiber. I’ve had a few people ask about adding ingredients. I don’t see why not. Obviously, if you add stuff it will change the nutritional values. Some things you could add are green beans, celery and onion. Also, I do not add salt and pepper, but you could do that as well. I tend to never use salt. Do you have a favorite Weight Watcher chicken recipe or crock pot recipe? I would love to check it out. Leave a link to it and the recipe in the comments! Here is another Weight Watchers chicken recipe you may like, Sheet Pan Spanish Chicken. I was just thinking about making this yesterday. So good! How many points is this?? And how many servings?? Does it matter if I use unthawed chicken? It doesn’t matter if the chicken is frozen or not. I always use frozen. If you use meat that has already been thawed out just cut the cooking time in half. How many lbs of chicken do you use? I think I use a pound and a half or 4 large pieces. I put it in the WW app calculator and it’s saying 11 points per serving (since she said above that it serves 4).